To ensure the success of your process control, you need the proper sensing device. Conrad Kacsik has it. We offer a wide range of thermocouples, thermocouple wire and thermocouple extension wire for precision and accuracy in any process. Our rugged thermocouples can be used to measure temperatures ranging from sub-zero to over 4000°F. Our full range of thermocouples includes general application, mineral-insulated magnesium oxide (MgO), base and noble metal. 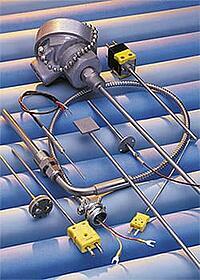 We also stock common thermocouple accessories, such as protection tubes, plugs and jacks. Whether you need a common thermocouple shipped quickly or a customized solution, our experienced engineers and sales staff will work with you to find the right thermocouple solution to meet your specific requirements—and deliver it with precision. Our thermocouples are manufactured to meet the highest industry standards and are typically used in many high-temperature processes, such as heat treating and those associated with molten metal and plastics. They’re also commonly used to perform system accuracy tests. Base metal thermocouples and assemblies: Whatever your application, we have a wide variety of thermocouples available to meet your exact need. We offer two basic types of base metal thermocouples with protection tubes, including bare and ceramic-insulated elements. Many variations of each type are available. As an authorized distributor for Watlow, we maintain an inventory of both high- and low-temperature Type K thermocouple wire, as well as a variety of thermocouple extension wire. Watlow wire is known for its premium performance and reliability because its quality controls assure superior uniformity. Our in-house metrology lab is ISO/IEC 17025: 2005 accredited by the American Association for Laboratory Accreditation (A2LA). And we test, calibrate and certify the thermocouple wire we carry to AMS2750 special limits tolerance and/or BAC5621 tolerance. Watlow Series 301 thermocouple wire: Because this wire uses vitreous yarn as insulation on both the conductors and the duplex, it retains flexibility after exposure to high temperatures. 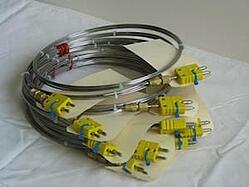 Conrad Kacsik maintains an inventory of K20-2-301, 20GA solid thermocouple wire certified from 100°F to 2,200°F. Its ideal applications include furnace survey work and heat treating load thermocouples. 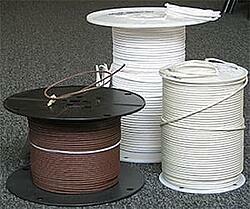 Watlow Series 309 thermocouple wire: This wire uses fiberglass yarn as insulation. Conrad Kacsik maintains an inventory of K20-2-309, 20GA solid thermocouple wire certified from 100°F to 1,600°F. Its ideal applications include furnace survey work and heat treating load thermocouples. Watlow Series 502 thermocouple extension wire: This wire’s primary and duplex insulation is PVC. It performs continuously at temperatures up to 220°F and is often used in conduit and wiring trays where its flexibility allows for easy installation. Series 502 extension wire can be easily stripped using hand tools or mechanical methods. It’s also ASTM E230 color coded for easy identification. Conrad Kacsik maintains an inventory of 20GA extension wire in J and K calibrations. To learn more about our thermocouple wire material, or any other of our brand name products, please contact us today.